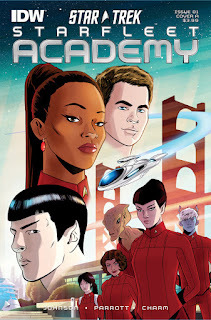 The Fellowship was fortunate enough to obtain a copy of STAR TREK: STARFLEET ACADEMY #1 from IDW Publishing. Mike Johnson and Ryan Parrott write, Derek Charm draws and colors, and Neil Uyetake letters. T’Laan, the only Vulcan at the Academy, is planning to leave. Until one of her instructors gives her a challenge, that is – represent the Academy in an academic competition. She’s not the most social creature on the team, but she’s a fantastic engineering student. But the delegation from the New Vulcan colony is the favorite, giving T’Laan much to consider. This story gives us a new set of characters in the rebooted ST universe. (It also gives us an Uhura subplot from before the 2009 movie, and hints to a connection there.) This first issue is a great setup for both technical and social interactions and conflicts, and brings together a very diverse group on T’Laan’s team. And the art really brings it with inventiveness in both the tech and the alien species. I admit I’m not a fan of the reboot, but I see some of the old emphasis on people and relationships in this story. So I’m in, and this looks like a good intro point to the ST comics universe. STAR TREK: STARFLEET ACADEMY #1 is available now at your FLCS or at idwpublishing.com.